This is an extremely popular series within the slot game realm, as game after game, they have produced slots of the highest quality with each of them adhering to the loveable Irish theme in a fun way. So make sure to put this one on your list when you play new online slot at Slotsbaby. 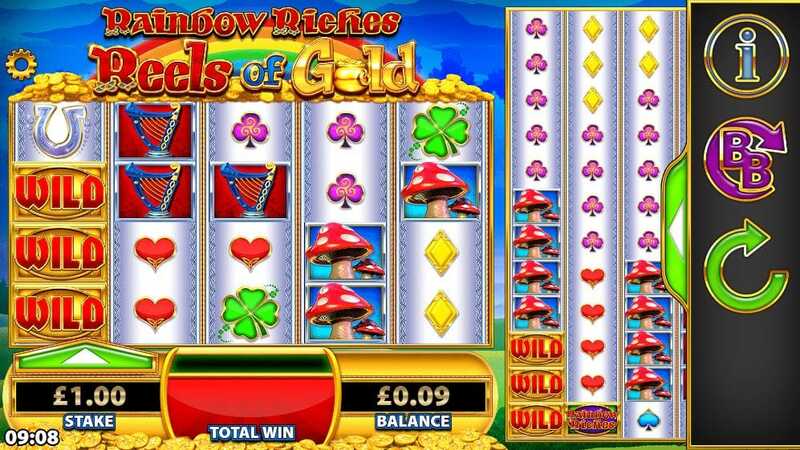 Like many slot games that look for a slice of that Irish luck, Rainbow Riches Reels of Gold brings all the symbols you’d expect from such a theme, but also brings so many bonus features and interesting ways to get your wins up, that along with the other Rainbow Riches latest slot games, it stands out as one of the best games with rainbows and leprechauns and the like. Barcrest is one of the most established creators of slot games thanks to a history f developing and creating them for the likes of chip shops and pubs. Now fully adapted to the online slot game world, they continue to develop great games that prove to be popular with gamblers. They are true legends of the fruit machine game and are now part of a larger organisation called SC Gaming. However, all the slots produced still wear the Barcrest moniker with pride. They’re also responsible for the rest of the Rainbow Riches series. Get the best out of our offers online before you play the game! So yeah, this game is so full of features that it feels very much like a goldmine of wins. Of course, that doesn’t mean that you should expect to win on every spin, but when you do win, there’s a sense of expectation about how much you can get your hands on, such is the amount of multipliers and bonuses awaiting for you in Rainbow Riches Reels of Gold. Another in the line of Rainbow Riches game, if you like the way this game is designed in terms of lay-out or in terms of it’s decent sense of humour, it’s definitely worth exploring more of the series. 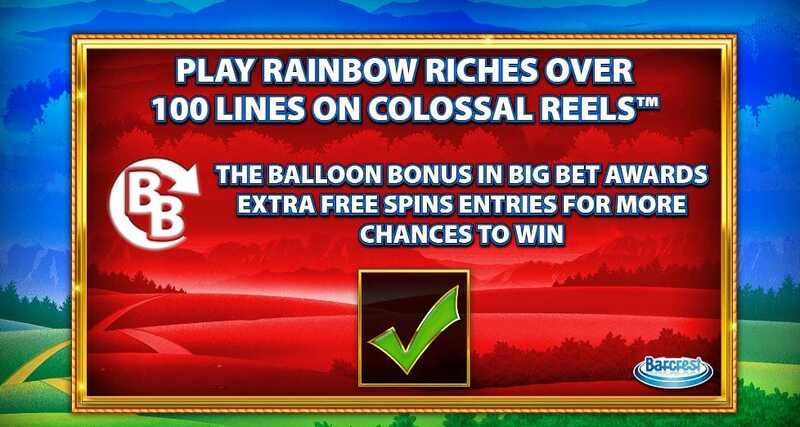 You can start with the original Rainbow Riches, a genuine classic in the online slot game community, and work your way onto the likes of this game, the aforementioned Rainbow Riches Pick n Mix or maybe Rainbow Riches Free Spins, where freebies are the order of the day. Where do we start with the bonus features in this one? There is so many that you can either jot them down and tick them off as you spot them during gameplay, or just sit back, play and wait for them to pop up. This is sort of where the whole bonus bombardment starts as, appearing at complete random and possible on any spin you make, a purple fairy can appear. This magical being can reward you with any of the following catalogues of bonuses. Starting with the Magic Wilds, here blocks of wilds will appear on the reels and move up and down randomly until they stop. Once stopped, they could reward you with a win. This one involves butterflies that will magically appear and perch themselves upon random symbols. When they do that, they turn those chosen symbols into wilds and you can enjoy all of the advantages of these new and improved symbols. Here, any of the low paying card symbols in view will turn in to a single magic symbol. There’s a lot magic here, for sure. This will then reveal the same symbol which is especially effective if you have a load of wilds on the reels, already. Pretty simple this one as these multipliers can multiplier the wins on your reels starting with a double score. Maybe not the most effective of the many, many features at work here, but certainly one to get you started at least. With Super Stacked Wilds, any wild symbols will expand to fill the reel they are on and they will also transfer over from the main reel to the colossal reels. Again, a bit of magic that can go a long way to a big win. Another thing that the fairy can do for you adds an extra balloon if you look like you need one. For example, say you’ve got two balloons on your reels, needing just one more to trigger that elusive free spins round, the fairy may just help you out with a welcome gift. Another power move from the fairy will see here if she wants to, shuffle the reels around to rejig you a win. Moving them up and down, with this special bonus she will magic you up a win. Read more about some of the great games available on the Slots Baby platform by clicking here.